Officials in Rio de Janeiro have said a recently-built stadium that will be used at the 2016 Olympics will remain closed for 18 months while the roof is repaired. 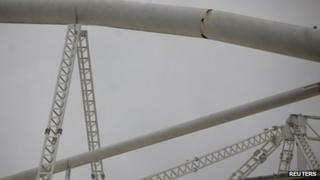 A committee of engineers said it had found a number of problems, including broken and twisted supports. The Joao Havelange stadium was closed in March after it emerged that the roof could collapse in high winds. It was opened late only six years ago at a cost of about $200m (£128m). The Rio authorities had seen it as a legacy project for the city. But a team of engineers concluded in a report that the project for the construction of the stadium had presented "structural errors" from the start. "It is a flaw which is related to the way the project was conceived," said Sebastiao Andrade, a professor of engineering at Rio de Janeiro's Catholic University (PUC), who contributed to the study. 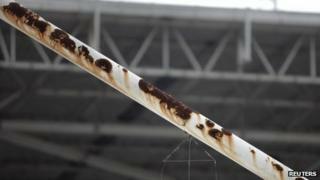 "There is a need to reinforce the roof's structure so the stadium can be used, taking into consideration the proper requirements of safety," he told journalists in Rio. Alexandre Pinto, the city's official in charge of public constructions, also admitted there had been "several mistakes in this project". "To close a stadium so soon after it was opened is a tragedy, is a shame,'' he said. 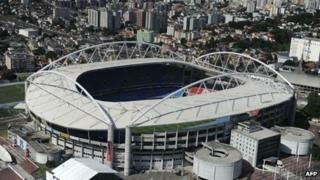 But Brazilian Olympic organisers said they were confident that the venue would be ready in time for the Games. "The Rio 2016 Olympic and Paralympic Organising Committee is satisfied that the solution presented by the city of Rio de Janeiro will allow the Olympic Stadium to be ready for the Games,'' the committee said in a statement. 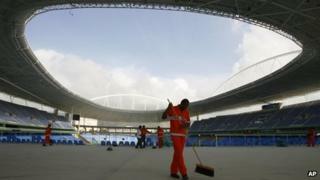 Friday's announcement comes soon after a stadium in northern Brazil, which will also be used for the Olympics, suffered a partial collapse of its roof. Renovated in time for this year's Confederations Cup, the Fonte Nova Arena, in the state of Bahia, was inaugurated in April. But its roof apparently was unable to sustain a large amount of water that settled on top of it following heavy rains.